Starring: Tyler Perry (Star Trek), Matthew Fox (Smokin’ Aces), Rachel Nichols (GI Joe: Rise of Cobra, Star Trek) and more. Rated: Rated PG-13 for violence, disturbing images, sexual content, language, and brief drug use. Tyler Perry stars as Detective Alex Cross in this third onscreen portrayal of crime novelist James Patterson’s famous character. Previously played by Morgan Freeman in Along Came A Spider and Kiss the Girls, Detective Alex Cross is on the trail of a serial killer whose specialty is inflicting pain and torture (Played by Matthew Fox of Lost.). Things get personal when the criminal threatens not only his city and his coworkers, but also his family. Cross must utilize all of his skills and resources as a detective, psychologist, and family man to track down and confront the roaming threat in his city. Under the direction of Rob Cohen (director of Stealth and The Fast and the Furious), Perry and Fox’s performances create the credibility of the story’s events. Tyler Perry shows that his acting ability exceeds that of “Madea” movies and he carries this film that suffers but from misdirection and insufficient screenplay writing. 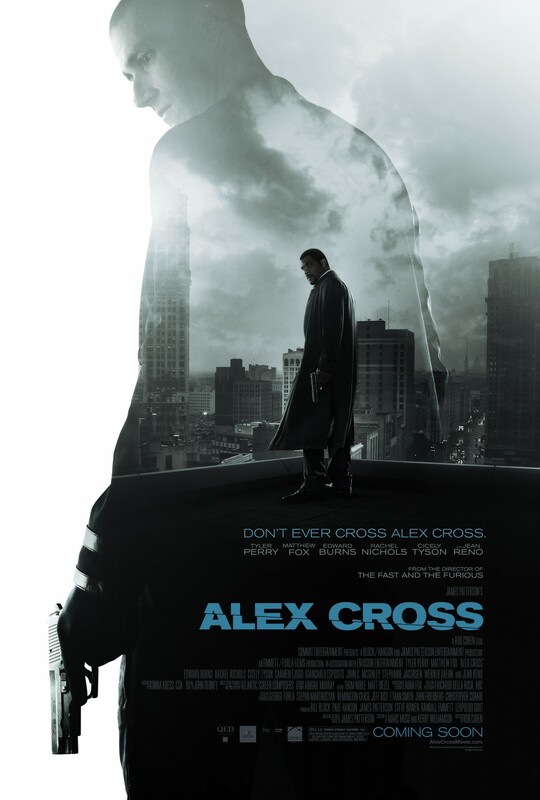 Alex Cross plays out like reading a book that takes a while to get moving as the screenplay wades through inconsequential and redundant supporting characters’ stories in order to bring additional emotion, attachment, and mystery to those around Alex Cross. It builds up the importance of certain characters, yet never really follows through with them in a satisfying manner. The result lends itself to nonchalant boredom. 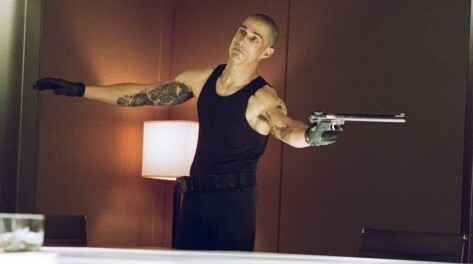 Matthew Fox as a decent villain victimized by dull storytelling. 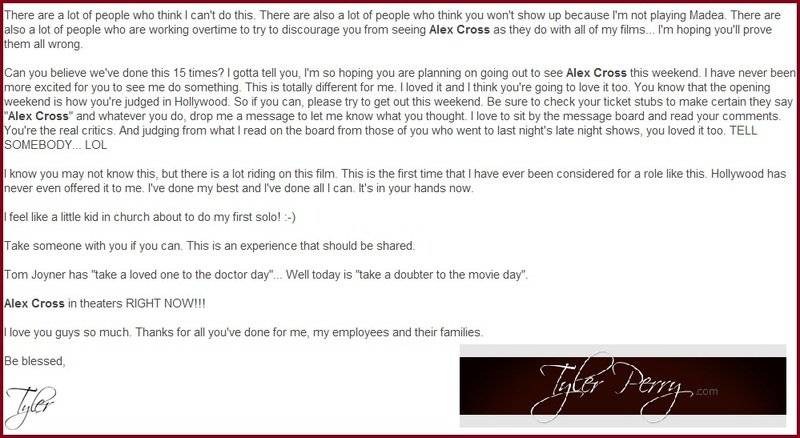 After reading the letter (thank you to my mom who forwarded the letter she received from her subscription to TylerPerry.com to me) and watching the film, I can’t help but to feel a bit bad for Tyler Perry because the film’s failures truly are not his fault. They are the fault of the director and the screenplay writers. If Cohen’s MIS-direction is a true representation of the prowess of James Patterson’s writing, then I highly question the taste of his readers. Patterson’s popularity and noteworthiness leads me to wonder just what happened in the translation from book to screenplay? It seems that Perry and Patterson were on the same page? Why not Cohen? 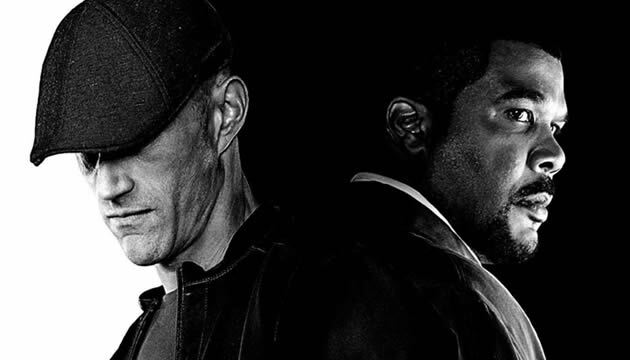 While director Rob Cohen’s inconsistent and uncertain directing style does not translate Patterson’s story so well (such as using the shaky cam technique to boost up fight scenes and predictable plot progressions), fortunately, Cohen did get some things right. The choice in cast proved to be the better part of the film. Those doubtful of Tyler Perry now may see a glimmer of hopefully more to come as Perry sharpens his skills as the lead in a thriller action franchise such as Alex Cross. He blends both drama and action effectively, despite the direction’s and screenplay’s misfires, and delivers what I expected from the character of James Patterson’s works. My advice to Tyler Perry: find another director for the sequel and continue to show us more variety in your film choices. Please keep it up. There’s more success with a Smith & Wesson than with a Smirk & Wig. 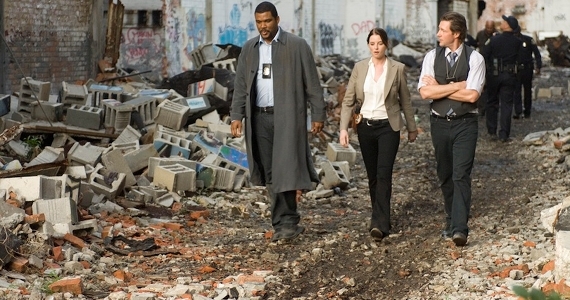 Alex Cross was better than I anticipated. Not great, mind you, but better than imagined. Give it a shot. I agree, the failure here is not Perry’s. He was fine. Nice email. I like that he’s so open with his fans. yeah, it was nice to read Perry’s email. a nice touch. I don’t know why they continue to let Rob Cohen direct movies. He’s a poor imitation of Michael Bay who makes one terrible film after another. I applaud Tyler Perry for trying something different and attempting to grow as an actor. While I’m not a fan of his Medea movies, he has truly made a name for himself with a niche audience is has been extremely successful with his brand. He could sit on his laurels and continue to dress in a dress or expand his career in other directions. I’d like to see him have a larger role in the next “Star Trek” film. I am glad that Perry expanded here and hope he continues to do so in the future. It’d be great to see him do more in the Star Trek Into Darkness! The sad thing is Cohen has been directing movies longer than Bay has, yet still seems like a bad carbon copy of Bay. Wait…. Starring Tyler Perry.. from Star Trek? He was in that movie for like 5 minutes. It took me longer to remember that he was in that movie than the amount of time that he was actually in it! Lol. That’s why I mentioned it. Completely different than what people remember him for. Haha a reminder that he can do more. This is a movie I completely skipped. Seeing Tyler Perry in the trailers alone was enough to send me running. Now I haven’t seen it but it looks like the casting of Tyler Perry may be the worst of the year. I couldn’t help but laugh at the trailer. Great review as always! ha. thanks Keith. your comment made me chuckle. I wasn’t excited for this one, but gave it a shot. Perry was the star. I don’t know, at 2 out of 5, I don’t think I’ll be giving it a shot. But if Perry did as well as you said, I hope he tries his hand at more non-Madea works. haha. it’s okay. maybe one day you might rent it just to see Perry do something more than Madea. haha. Thanks for the link, btw my friend. Thank you very much.